In order to maintain the functionality of your home or office, it's important that the electricity is operating properly and efficiently. When dealing with electricity, you want to be sure you have hired an experienced, licensed professional to help assist you. Installing or replacing electrical outlets and receptacles isn't as easy or simple as it may seem. 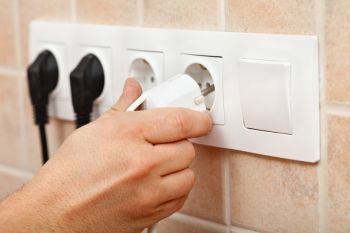 Not to mention, with thousands of electrical connections in your home or commercial building, it can be dangerous to do yourself. Why risk it? Whether you're looking to have outlets installed, existing outlets replaced, or have existing outlets grounded, the expert electricians at Meehan Electrical Services can help. Since 1960 we have been the leading electrician for outlets, switches and plugs. Meehan Electrical Services can install and replace single, combo, duplex, triplex and quadplex outlets to your specification, as well as outlet covers for your safety. Where Should New Outlets Go? The knowledgeable electricians at Meehan Electrical Services are all up to date on electrical code requirements to ensure new outlets are installed in the proper intervals of your home or office. Our team of electricians are qualified to determine the proper location and spacing for newly installed outlets. Meehan Electrical Services consistently follows all local electrical codes and National Electrical Code rules to follow the electrical receptacle height and clearance restrictions. Time to Replace or Repair Existing Outlets? If your outlets are sparking or are overheating, it's time to call an experienced electrician to replace your existing outlets. Meehan Electrical Services has over 59 years of experience replacing outlets in walls and floors of homes and businesses. If your home or office has old or unsecured wiring, faulty electrical devices, overloading or were not installed properly the first time, Meehan Electrical Services can repair your existing outlets in no time. Call (706) 717-4947 for a free quote!